VoloDocs is a cross-platform web application that allows you to easily create beautiful documentation and build developer communities. It simplifies software documentation with the help of GitHub integration. You use the power of GitHub for versioning, hosting of your docs. You let your users to edit a document. Serves documents from your GitHub repository. Supports Markdown / HTML document formatting. Supports versioning (integrated to GitHub releases). Allows users to edit a document on GitHub. Cross-platform; deployable to Windows / Linux / macOS. Notice that, all installations are self-contained deployments. It means all the required third-party dependencies along with the version of .NET Core is included. So you don't need to install any .NET Core SDK / Runtime. When you extract the VoloDocs. *.zip file, you will see a Web folder and a Migrator folder. The Web folder contains the website files and Migrator contains the application to build your database. Before publishing your website, you need to create a new database or update your existing database to the latest. If this is the first time you install VoloDocs, Migrator will create a new database for you, otherwise it updates to the latest version. The only setting you need to configure, is the ConnectionString which is located in the appsettings.json file. 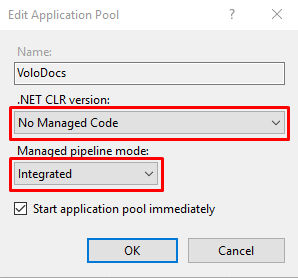 See the next section to learn how to configure your VoloDocs application. To update your existing database or create your initial database, go to Migrator folder in your VoloDocs directory. Open appsettings.json in your text editor and set your database connection string. If you don't know how to write the connection string for your database system, you can check out https://www.connectionstrings.com/. After you set your connection string, run Migrate.bat for Windows platform and VoloDocs.Migrator for other operating systems. That's it now configure your website. Go to Web folder in your VoloDocs directory. Open appsettings.json in your text editor. Set your connection string (same as in the Migrator's appsettings.json). Set title of your website. This will be written on the left-upper corner of your website. That's it! Now you can publish your website. In the previous step, you created or updated your database. Ensure that your database exists on the specified connection string. Move Web folder to your wwwroot folder. Rename Web folder to VoloDocs (Now you have C:\inetpub\wwwroot\VoloDocs). If you get the below error, it means don't have the hosting bundle installed on the server. See this document to learn how to install it or download Hosting Bundle and run on your server. 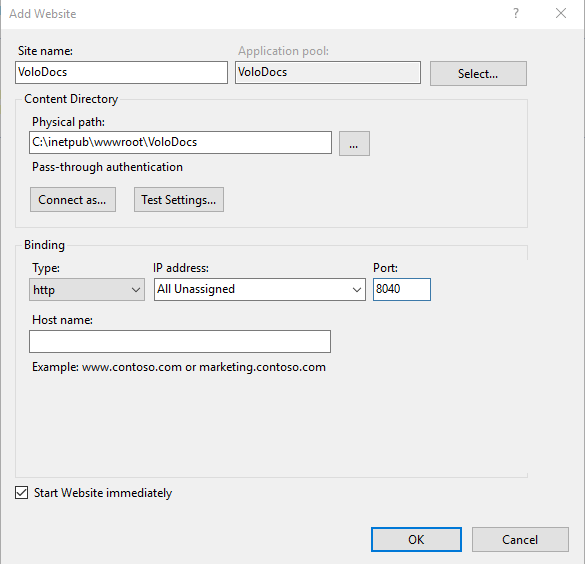 Further information about hosting VoloDocs check out Microsoft's official document for hosting ASP.NET Core application on IIS. Microsoft has a good document on how to deploy your ASP.NET Core web app to Azure App Service. We recommend you to read this document https://docs.microsoft.com/en-us/azure/app-service/app-service-web-get-started-dotnet. Alternatively you can run the application from command line, navigate to VoloDocs\Web folder and run VoloDocs.Web.exe for Windows or VoloDocs.Web for MacOS / Linux. To start the website, navigate to your address (as configured in the previous section). When you first open the website, you need to create a project. Here's a sample project information that uses GitHub source. We will configure the VoloDocs to show ABP Framework's documentation that's stored in GitHub. To create a personal access token in GitHub, you need to visit the Settings of the user account and under Developer settings you will find Personal access tokens. Select Generate new token, enter in a name as the Token description and enable the repo checkbox. Alternatively, to enter generate new token, browse to https://github.com/settings/tokens/new. To access public repositories, check public_repo under the repo section. This will enable VoloDocs to access your public GitHub repositories. Click Generate Token button on the bottom of the page. To access public repositories, check all items under the repo section. This will enable VoloDocs to access your private GitHub repositories. Click Generate Token button on the bottom of the page. To learn your GitHub username, click on your profile picture on the top-right corner of the GitHub page. You will see your username right after the text "Signed in as ..."
After you save the project, go to root website address and you will see your documentation.